If you can’t find a way, make a way. If there is no door to open, kick down the wall. And if something already exist, make it better. That seems to be the approach of Gerald Griffith. Gerald is the brains behind a small meetup group turned big deal voiceover resource in the industry that has now launched one successful VO Conference and is now poised to put on the second this march called VO Atlanta 2014. The conference is the largest of its kind in the Southeastern United States. I was first introduced to Gerald’s Voiceover City last year while at a networking event where I met a photographer who knew him. He said to me “You do voiceovers? 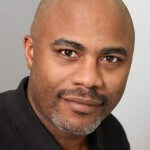 You should know Gerald Griffith!” He gave me the Voiceover City Website and I checked it out. I was skeptical. A meetup group for Voice Talents in Atlanta? What could this group offer me? And even after meeting Gerald at a “Get Connected” event, I was still not excited. I inquired with him about his background. “So let me get this straight. You don’t do voiceovers but you want to lead an army of talents into this industry war for work? I don’t think so buddy” is what I thought. But having an open mind I attended a meetup. I was still not convinced that this was the way to go. But what I was warming up to was this guy who loved voiceover and the power of the voice. Gerald seemed so passionate about teaching and learning. It was baffling to me. “Why not just start your own voiceover career?” I wondered. But I stayed in touch. 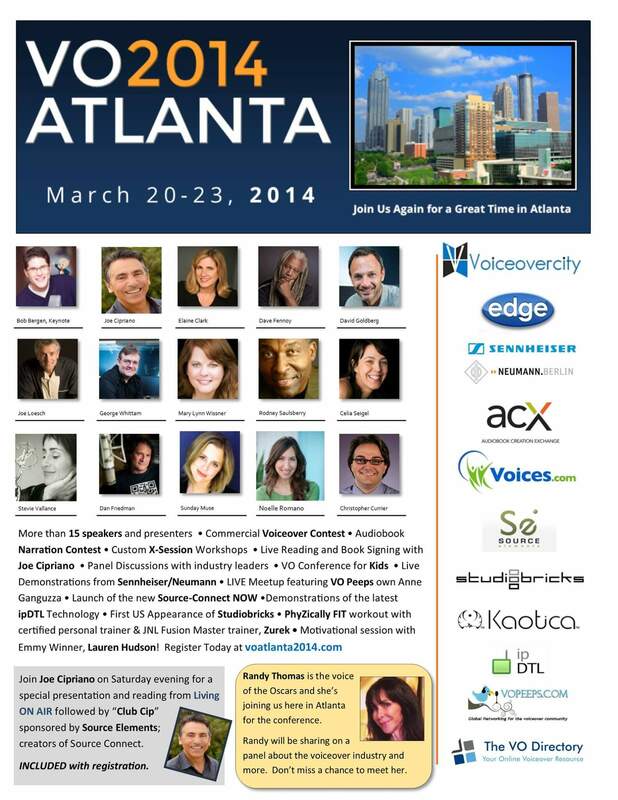 VO Atlanta 2014 is set for March 20-23 and will feature even more stars than last year. With a successful conference last year, more great talents and vendors signed on to be presenters and exhibitors this year. Animation Voice Actor Bob Bergen headlines as this years keynote speaker. CBS and Fox promo superstar Joe Cipriano will be doing sessions. Also presenting is Randy Thomas (Emmy Announcer) Elaine Clarke, Edge Studio’s David Goldberg, Mary Lynn Wissner, Celia Siegel, George Whittam, Dan Friedman, Sunday Muse, Stevie Vallance, Noelle Romano, Rodney Saulsberry, Jeff Umberger and my friends Joe Loesch and Dave Fennoy. The conference promised to be filled with a lifetime of knowledge and networking for voice talents at all levels. In Addition to talents there promise to be plenty of sponsors like Voices.com, Kaotica, Neuman and Sennheiser to name a few and 2 workout sessions with JNL Fusion Master and Certified Personal Trainer Zurek. With all of the planning, logistics, and marketing that goes into a conference, you wonder how Gerald has time to sleep, much less simultaneously launch something new for the VO world. And yet he is. As the conference is in its final stretch before next weekend, the VO Directory, Gerald’s newest project is in it’s infancy. TheVoDirectory.com will be a one stop shop for Casting Directors, Agents, Talents, Vendors, Coaches, Organizations and more to post, market and gain great information on todays’ top trends in the industry. In speaking to Gerald, he wants to offer something to the voiceover community that is smarter (technology wise) and easier to use than what is presently offered. After interviewing Gerald, and delving into his mind, I now keep a close eye out for him. Not only has he cooked up 2 big conferences, a resource directory and a growing meet up group, but he is sure to be the successful mad scientist behind other big ideas. Another winner! Thanks for presenting a great guy with a lot to offer for anyone involved in vo. VO2014 Atlanta sounds like the place to be! I’m interested in learning more about Voice over opportunities and meeting voice over actors. Where may I join or meet? There is a voiceover conference going on right now in atlanta. VOatlanta2014.com. Or check out local meetups in or near your area.